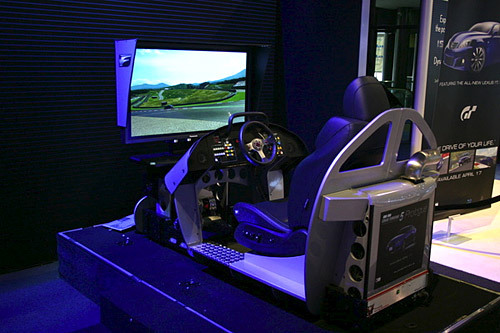 Lexus had three driving simulators set up running the highly anticipated Gran Turismo 5 Prologue that’s due out in mid-April. Since it was obviously a Lexus partnership, the only vehicle available to try was the Lexus IS-F…The first day of the show, the simulator was running a custom-build platform (meaning the developers sent out a special copy of the game just for the show), but Polyphony managed to overnight Japanese retail builds of the full game to be used on the simulators. A groggy representative told me he was up until 3 a.m. waiting for the retail build and setting up the simulators to properly work with a PlayStation 3 and the Japanese game. That a lot of midnight oil for a cross-marketing opportunity. In terms of cross-marketing, as the writer mentions, this could only be described as a coup for Lexus, there simply isn’t a better game to be associated with in terms of brand cache. Subaru might have been running a similar exhibit, but featured a version of GT4 rather than the new, heavily anticipated GT5.